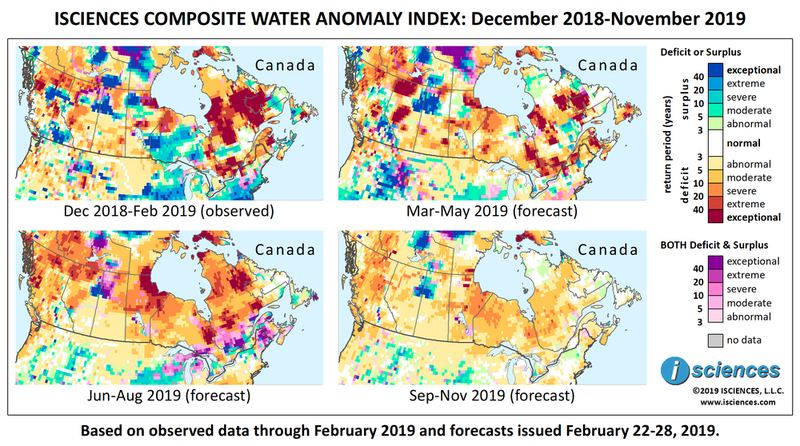 The 12-month outlook for Canada through November 2019 indicates water deficits nearly coast-to-coast in the provinces, with large pockets of exceptional deficit in Quebec and in parts of the Prairie Provinces’ northern environs and British Columbia. Intense deficits are also forecast in a block on the northern portion of Ontario’s eastern border, central New Brunswick, and southern Vancouver Island, British Columbia. A large block of exceptional surplus is forecast from Fort McMurray, Alberta past Churchill Lake, Saskatchewan. Surpluses of varying intensity are forecast for southeastern British Columbia, and at the opposite end of the country at the mouth of the St. Lawrence River west of the Manicouagan River. The 3-month maps (below) show the evolving conditions in more detail. The major changes forecast through May are that exceptional deficits will shrink in Quebec (QC) though large pockets will persist, and widespread surpluses in Northern Ontario (ON) will transition to deficit. As for major population areas in the country, intense deficits remain in the forecast for Southern Ontario east of Georgian Bay and through southern QC east of the St. Lawrence River. Conditions west of Toronto will be relatively normal. In other metropolitan areas, extreme to exceptional deficits are forecast near Vancouver, British Columbia (BC); extreme deficits near Winnipeg, Manitoba (MB); and severe deficits surrounding Regina, Saskatchewan (SK). Elsewhere around the country, deficits of varying intensity are forecast for Newfoundland, Nova Scotia, New Brunswick, and many regions of MB, SK, Alberta (AB), and BC. Deficits will be exceptional in northeastern MB around Hudson Bay; the Upper Assiniboine River Watershed on the southeastern border of SK; the Middle and Upper Reaches of the Athabasca River in AB and in the northwest of the province; and pockets in BC around Prince George. Surpluses will downgrade in northwestern MB and in the Peace River region west of Fort St. John, BC; and will increase in a vast stretch from Fort McMurray, AB to Cree Lake, SK. In southern BC, surpluses will increase in the southeast and transition to deficit in the southwest. From June through August, deficits will increase. Moderate to exceptional deficits are forecast for much of QB, ON, and MB, though surpluses will emerge in southern QC and conditions of both deficit and surplus as transitions occur. In the Prairie Provinces, mild deficits are forecast in southern AB and southern SK, and primarily moderate deficits in southern MB. Deficits will increase across the northern halves of the Prairie Provinces and in BC. Exceptional surpluses will persist around Fort McMurray, AB; exceptional deficits in the Middle and Upper Reaches of the Athabasca River will downgrade but will be severe. Surpluses in BC will shrink, persisting in pockets of the southeast. The forecast for the final three months – September through November – indicates that deficits will shrink and downgrade overall. Surpluses will persist and increase across the shared northern border of AB and SK. The Insurance Bureau of Canada asked all levels of Canadian government to include sturdier development, designed to withstand severe weather, in future urban planning after one January storm caused $39 million (USD $29 million) in insured damages in Quebec and the Maritimes. The storm dumped heavy snowfall, rain, and freezing rain that flooded roads, submerged cars, and caused black-outs. A state of emergency was declared in Chatham-Kent when a dike on the Thames River in Southern Ontario failed, flooding local farmlands and threatening to flood riverside neighborhoods. Forecasts of spring flooding along the Red River in southern Manitoba could threaten to close Highway 75 this year as in the past. The route is an important trade conduit connecting Manitoba to the United States, and shut-down could cost the Canadian trucking industry up to $1.5 million (USD $1.12 million) per week. The New Brunswick government is in search of buyers for two waterfront homes that it purchased as part of a plan to raise and straighten the only access road to Darlings Island, which is prone to flooding during springtime snowmelt. The call for bids comes with a firm condition that the properties be moved in response to the flood mitigation project. There are numerous regions around the world where country borders are contested. ISciences depicts country boundaries on these maps solely to provide some geographic context. The boundaries are nominal, not legal, descriptions of each entity. The use of these boundaries does not imply any judgement on the legal status of any territory, or any endorsement or acceptance of disputed boundaries on the part of ISciences or our data providers. Thank you! ISciences Global Water Monitor & Forecast Watch List will be delivered to you beginning next month.